I have only recently got into Pinterest and the one thing that I am absolutely loving it for is interior design and home decorating ideas! I am moving in with my boyfriend in August and although that seems like a long time away still, I can't help but get excited about all the cute different ways we could make our place more homely. 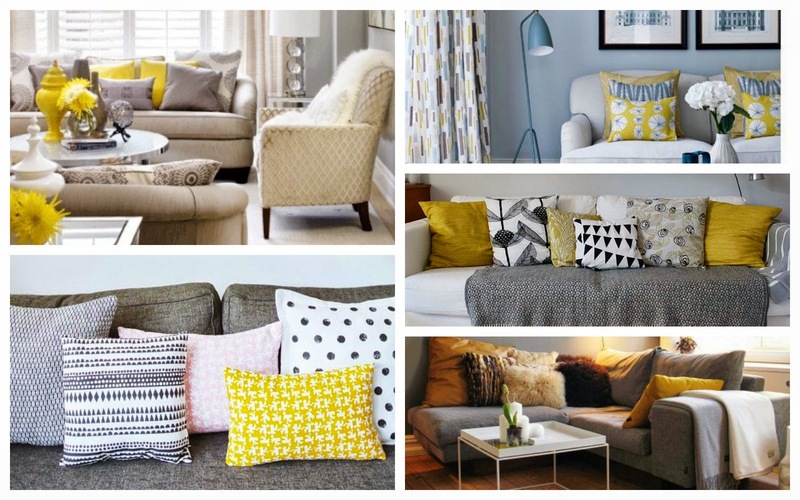 One thing that I have noticed a lot of on pinterest at the moment is grey sofas and I absolutely love them - I feel like I am destined to get one for our new place! To add a bit of colour to actually quite a simple colour, a pop of yellow and blue/aqua is my ideal of heaven. I was in TKmaxx the other day and I fell in love with a grey, blue and yellow pillow and even though I would have no where to put it at the moment, I was definitely tempted to invest. This colour combination is sensible but cheery, classic with a twist, and stylish and modern all wrapped into one! What colour schemes are you loving at the moment? Let me know! Check out my Pinterest to see more of my ideas. Pinterest rocks, It's great for new hairstyle recommendations too. Teal is my go to colour for homeware or clothes these days. Loving hot pink as well! That is the same thing I go to Pinterest for!